Winston Churchill, the former British Prime Minister and one of the greatest wartime leaders of modern history, was voted out of office in July 1945, just two months following the end of World War II in Europe (VE Day, May 8, 1945). In the first general election since 1935, (general elections had been suspended during Great Britain’s involvement in the Second World War), the stalwart British hero, whose speeches comforted and rallied a war-torn nation that was relentlessly and brutally under siege throughout the war by Nazi Germany and other Axis powers, became an unnecessary leader in the eyes of the British people. In a stunning election defeat, Churchill, revered as a hero and respected by the British people, was deemed unqualified to lead the Country past war time politics into peacetime. What went wrong? What leadership lessons can we learn from history when someone considered one of the greatest leaders in modern history, can lose an election a mere two months after leading his country from near certain defeat to victory in a world war? During the war, Churchill’s most imperative objective was to maintain and expand morale and to motivate the country into a willingness to keep fighting, even though all seemed lost. Perhaps he put too much effort into saving the character, heart and soul of his nation at the expense of party politics which lost him support. Perhaps the issues confronting Churchill initially, to keep the faith of the country alive should have modified as the tide of the war moved toward the Allies. 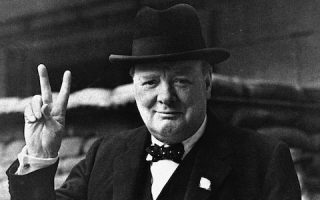 Some movement into the political realm of a peacetime Britain may have appeased critics, who believed Churchill was explicitly a wartime leader. Amending the political agenda might have saved the election for himself and his party. As you can see in the case of Churchill, defining yourself as a leader is a never-ending process. Maintaining the status quo, even in victory or great success, hinders your ability to lead into the future. Sooner or later you come face-to-face with the dilemma of the need for change, or in Churchill’s situation, losing purpose and direction, because change wasn’t effected. Innovation and change are not easy. There will be opposition and apprehension to change as it is introduced. You may succeed in initiating the change. You may possibly fail. Either way, there will be a need to begin anew at some point. Those successful at one time, may now descent into failure and those who failed initially, might ascend toward success. The only real injustice to the entire process is if you never attempt to transcend past the status quo. Leadership should always carry a bit of stress and uneasiness. That’s how you know you’re moving out of the status quo. If you have done your due diligence, become informed and fully support what you are attempting to accomplish, then you should be ready for the inevitable backlash, however hard or slight, to the proposed change you promote. One of the biggest issues facing leaders, is the ability to understand the effects of the change you promote and to follow those changes, evaluate them and make necessary changes as time passes. Churchill understood what had to be accomplished initially but lost sight of the consequence the change and programs he implemented, had upon the nation as the winning attitudes of the war changed and the time to think about a peacetime economy and nation had to be addressed. Be alert to settling into the status quo. Evaluate and change your objectives towards the ultimate goal or agenda needed at that time. Do not fear changing attitudes and rattling the cage when circumstances indicate. Leaders are supposed to make positive change and impact wherever they work. You may enter the journey with hesitation and doubt, but in the end, the ultimate rewards can make what was once thought of as improbable, possible. Author: Chuck Wallace is the current Past-President of the Washington State Emergency Management Association (WSEMA) He has an MPA and speaks throughout the country on issues related to emergency management barriers and practice. His email is [email protected]. The coalition cabinet during the war gave socially oriented ministries like housing and welfare to Labour. The Conservatives got Foreign Affairs, War and the Admiralty. With peace, the voters chose to go with Labour in 1945.